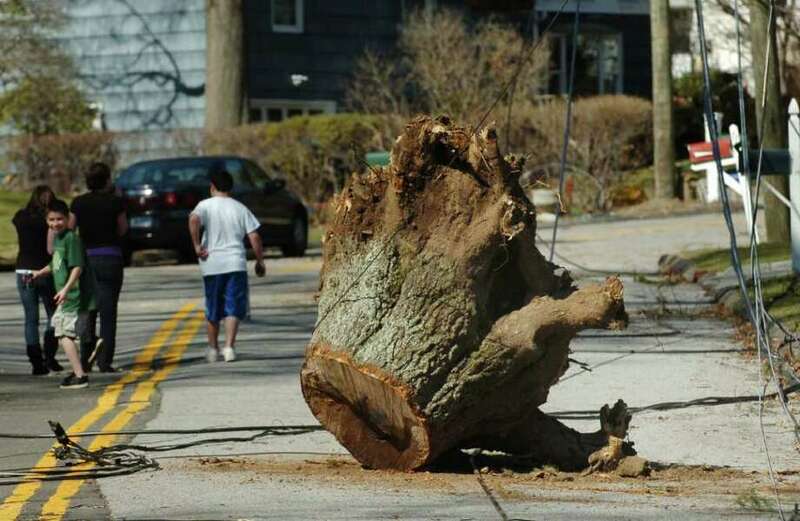 A tree stump sits on Alpine Street in Stamford where power was knocked out for a week after the March 13 nor'easter that ripped through the area. STAMFORD -- The Gonzalez family has cut down all the pine trees on their property since last March, but there's one tree limb that they plan to keep forever. "The kids affectionately named the branch Henry," Nella Gonzalez said. "So we're going to keep him. He's part of our family." Henry entered the Gonzalez's home on Pepper Ridge Road during last March's nor'easter, and he didn't use the front door. The family was taking shelter in their basement family room when they heard the crash. A pine tree had fallen on their house and a large branch was jutting across the dining room table where John Gonzalez had been eating dinner an hour before. As the family surveyed the damage, another gust of wind sent a second pine down on top of the first one. "At that point it became chaos," Nella said. "There was water gushing everywhere. It was literally raining inside the house." The damage to the Gonzalez's home was extensive. There was the large hole caused by Henry, about three feet in diameter, and several smaller holes as well. The dining room table and rug were damaged, and the family had to redo their roof and the home's electrical wiring. All told, it took about $25,000 and one month of repairs before the family could move back in, Nella said. A year later, things are mostly back to normal. "We're able to chuckle about it," Nella said. "We ended up putting a skylight where the hole was, since there was already an opening." The March 13, 2010, nor'easter wreaked havoc in Stamford and throughout Fairfield County. Torrential downpours and fierce winds felled trees and telephone poles across the region. Norwalk recorded winds gusting as strong as 65 mph at the height of the storm. At one point, 24,000 of Stamford's Connecticut Light & Power customers were without power and some residents waited six days to regain electricity. The devastating storm sparked house fires, punctured holes in roofs, flattened cars under falling tree limbs and required a full out response by emergency responders from the city and state. For Michael Pavia, his first test as the new mayor of Stamford blew in during the city's St. Patrick's Day parade, barely three months after he was sworn into office. By 2 p.m., the city had activated its Emergency Operations Center. As the weather worsened, Pavia drove to the Government Center. "Trees had just started to come down left and right," he said. "The skyline was lighting up all these different colors from the power lines that were falling down and the transformers that were exploding. It was just a very bizarre scene." When the wind and rain stopped, the city was covered in debris. "It was probably the most destructive storm I have ever seen in my life," Pavia said. "Hundreds, maybe even thousands of trees were down. We wound up cutting up and hauling away over a million pounds of trees and debris." While CL&P was harshly criticized for what many people characterized as a slow response to the massive power outages, Pavia said the company did an excellent job given the circumstances. "I know some of the communities were very critical of CL&P, but I have to tell you that having their personnel embedded with our emergency control team was a tremendous help," he said. The state saw 102,601 CL&P customers lose power during the nor'easter, the majority of which were in Fairfield County, said utility spokesman Mitch Gross. The company has made several improvements in the aftermath of last year's storm, he said. "We have a much stronger communications process with town officials," Gross said. "We have trained 150 of our employees here to be available as town liaisons that would supplement our account executives if need be." Sgt. Tom Lombardo, the city's emergency management director, said the city's Emergency Operations Center remained open 14 to 16 hours a day for a week after the storm. Lombardo said he received over 240 reports of damage from city residents, ranging from several hundred to a quarter of a million dollars. So far, the city has received $85,000 in funds from the Federal Emergency Management Agency, said Grants Officer Karen Cammarota. FEMA is still reviewing Stamford's aid request for $535,000 in costs the city incurred for debris removal. Stamford could receive a maximum reimbursement of 75 percent, or $401,000, Cammarota said. The city was very lucky that none of its residents were killed or injured during the nor'easter, said Police Chief Robert Nivakoff. Falling trees killed two women in Westport and Greenwich. "It was dangerous," Nivakoff said Friday. "It was the largest storm that we had responded to in at least 30 years." In part because of the nor'easter, Nivakoff decided that the Police Department needed its own Emergency Operations Center in addition to the one at the Government Center. "We built it, and it's up and running," he said. Exposed electrical wires sparked several house fires over that weekend, Fire Chief Robert McGrath said. The biggest obstacle his firefighters faced was getting to the emergencies. "We were hampered getting to the fires because of downed trees and wire lines and road blockages," McGrath said. "At one point, we had approximately 200 calls for service in the 911 center, so I had to bring back people to help take the calls and prioritize the calls." The storm gave the Fire Department an opportunity to test its emergency radio system, which allows all the city's departments to communicate with each other during major events. McGrath said the system worked "stellar." Stamford Emergency Medical Service Captian Bill Ackley said his workers wore helmets during the storm to protect their heads from falling debris. The nor'easter taught Stamford EMS the value of communicating with emergency responders from surrounding areas, he said. "We developed a much stronger communications network with Greenwich EMS and we had discussions about getting more supervision and crews in earlier and also to improve communication with the state," Ackley said. Stamford schools remained closed for a week after the storm out of concern that school children might encounter fallen wires while waiting for the bus, Public Schools Superintendent Joshua Starr said. "I remember a couple days were beautiful after the storm," Starr said. "Sunny and nice spring days and yet we couldn't have school. It's just disruptive." For local building contractors, the storm's aftermath meant several sleepless nights. Joe Pelli, president of Servpro of Stamford, said his employees worked 16- to 18-hour days for weeks. The company ended up doing 375 jobs in the area after the storm. "If I had my Servpro shirt on when I was getting lunch at Sierra Grille, I would have three customers come up to me and say: `Can you look at my house?' " Pelli said. "It was basically nonstop." Final repairs are still ongoing at Sterling Farms Golf Course, which saw more than 100 trees fall on its 144-acre property, Executive Director Paul Grillo said. "We're slowly fixing all the buildings and we're still planting trees and removing stumps," Grillo said. "For the most part, from what the average public can see, we're in good shape." At the Gonzalez home, Henry is the only physical reminder of the pine trees that crashed through the dining room on March 13, 2010. "Right now, he's in my husband's man cave, which is his movie theater that's decorated in Jets stuff," Nella said. "Henry hangs out in there. Obviously, he didn't bring the Jets any good luck this year."